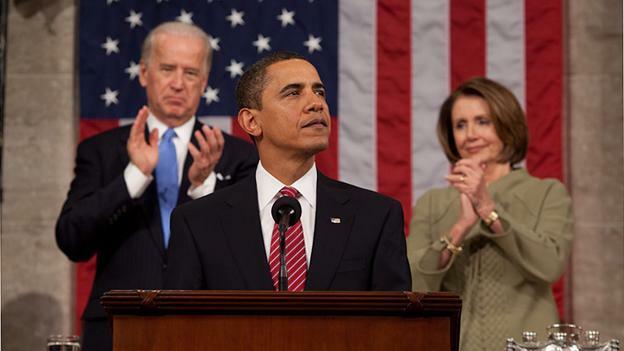 By my rough estimate, 114,278 bloggers have already commented on President Obama’s State of the Union Address. (That’s the SOTU by the POTUS, to use the acronyms favored by ostentatiously au courant bloggers.) So what can The New Moderate add to the day-old conversation? We can observe that our bruised and battered yearling president finally recovered his mojo last night. It was about time. Obama had been heading down the road once traveled by Jimmy Carter: the charming and magnetic candidate, the thoughtful outsider who won voters’ hearts with his candor and integrity, seemed to be morphing into a classic policy wonk — smart and conscientious, certainly, but also aloof, indecisive and oddly uninspiring. It was a galvanizing, brilliantly delivered speech — probably the best of his presidency. (How Obama manages to look and sound spontaneous while reading off a teleprompter is one of life’s great mysteries.) Obama was statesmanlike, eloquent, compassionate, relaxed and witty. He was feisty, too. In fact, he went out of his way (conveniently, some critics would argue) to chastise the two branches of the federal government not under his direct supervision. Did Obama step out of line? Perhaps he did, but these are extraordinary times that call for bold and unorthodox gestures. If Obama hadn’t stepped out of line, we might continue to drift silently and inexorably away from representative democracy toward government-by-lobby. Conservatives have huffed about Obama’s anti-corporatist stance on campaign spending as a blatant violation of First Amendment free-speech rights. I say hooey! Since when is an unlimited advertising budget guaranteed to us by the Bill of Rights? How many private citizens can afford to advertise on behalf of their chosen candidates? No, Obama’s gesture was a long-overdue recognition of popular outrage at a system that favors moneyed interests over the common good. Any moderate worthy of the name would strive to tip the balance back to the center, so that no special interests — right or left — can gain the upper hand. Eventually, all private interests should be banned from funding political campaigns. Given the current make-up of the Supreme Court (that’s SCOTUS to the blogging community), the corporations and powerful lobbies will continue to have their way with Congress (and with us) for years to come. But Obama’s disciplinary moment gave the put-upon public a welcome opportunity to vent some anger, at least by proxy. We moderates have a lamentable tendency to please nobody by trying to please everybody. Obama is no exception. Many of his former enthusiasts on the left zapped him after his speech. Why? Obama talked a good talk, the progressives argue, but he outlined precious little in the way of concrete plans to bail out ordinary Americans during the Great Recession. Where are the FDR-style public works programs and safety nets, they ask. Even I have to admit that tax credits and belt-tightening don’t really soothe the suffering or inflame the imagination. 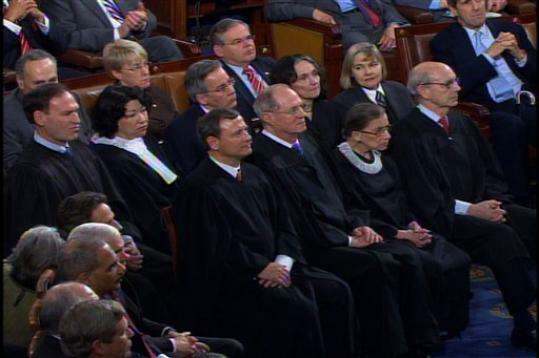 What inflamed the imagination last night was the tone of Obama’s State of the Union Address. (In speeches as in upscale restaurants, presentation is everything.) After a year of wobbling, wandering and regrouping, the president seems to have reached inside and rediscovered his animating spirit. I like that spirit: a seamless combination of heart and intellect, optimism and caution, idealism and pragmatism, humor and high purpose. In short, Obama embodies moderation at its best. From such a spirit good works would almost certainly flow — if only our fractious and tainted government would let them. “Obama embodies moderation at it’s best” Ummm… not doing much? Isn’t that the problem? Not that he isn’t trying, I have high standards, and I want him standing over the Democratic congress with a cudgel or whip to get them off their asses. He talks a good talk, but he repeated alot of stuff he said he was going to have done by now, like don’t ask don’t tell. It was a good speech, let’s hope for results now. I could write a separate post about the campaign pledges Obama hasn’t kept (but it would involve a lot of research and hey, who has the time?). 😉 Seriously, most presidents leave a trail of broken campaign promises behind them, partly because they’ll say anything to get elected and partly because of stiff opposition from the other side of the aisle. Moderation at it’s best brings the best ideas and motives of both sides to the table. Obama is a divider, not a uniter – if he were a moderate he would not attack his predecessor, the opposition party and SCOTUS, in order to deflect criticism of his own failures. He has not delivered on a single campaign promise that I know of, even with overwhelming majorities on both houses of Congress – Bush, as bad as he was, delivered his promised tax cuts, NCLB, and Medicare prescription drug plan, all by working with the Dems – when he tried to privatize part of SSI, he lost the Dems and failed. Clinton delivered welfare reform by working with the GOP. To me,Obama appears incapable of real centrism, just talks about it. Not to mention that he totally demagogued that SCOTUS decision, by flat-out lying about its effect. Exit question: assuming we are all against big money lobbies influencing elections, how do you square the Big Unions who fund Dem politicians with tens of millions, taken from enforced dues, with that ( Politicians who then support card-check, btw)? Obama isn’t attacking Bush, it’s just that any time W is accuratley represented, he looks like a moron… The problem, as I see it, is that he did try to work with the Republicans, who refused to compromise on anything at all. Add to that the fact that not even his own party wants to work with him, it’s easy to understand how it must be hard to get promises fullfilled, but not how it apears that he really hasn’t worked hard enough to gain the support he needs on his own side. The unions are not problems because they are not for profit corporations, they are workers rights organizations. They spend tens of millions against tens of billions in coporate spending to but politicians. Priscilla: Campaign reform has to start someplace, and eliminating big money from corporations is a good start. As I said, eventually the system should be reconfigured so that no special interest can buy an election. Of course, that means raising taxes, but I think it”s a small price to pay for regaining a pure representative democracy. “uniter” is keeping red underlined as if the word doesn’t exist…or maybe it was invented by the young Bush. I remember Bush saying that he’s a “uniter” and a “decider”. … but the jokes aside Priscilla, can you name one, just one US president who did not attack his predecessors when the Party changed and the economy was going down? Valdo: You have a point about presidential attacks on their predecessors. Nobody can deny that Obama inherited an unholy mess, and now Republicans are gaining ground. I don’t think Obama should overdo the blame game, but I can’t blame him for playing it. I don’t think Obama is playing the blame game, he’s just correcting Republicans when they do. They are trying to blame the entire economy on him, when the blame rests with their party, (mostly) and the president who let it slide for eight years. (And Clinton, who also is responsible for removing some of the fail safes that led to the housing debacle.) Rebuplicans keep putting forward the same things, tax cuts for big business, and cutting government spending at home. Eight years of that and the “Great Recession” have failed to teach them to try something new. Many, many presidents inherit an unholy mess. God knows, Ronald Reagan did – yet I would defy you to find me one quote where he whined about it all being Carter’s fault. Clinton inherited a lot of economic and foreign policy messes, but he did not attack Reagan or Bush 41. Sorry but just attacking the policies of your predecessor is not a solution, and the “Blame it on Bush” song is getting really played out. TK/Valdo , I am not, and was never a big Bush fan. But I am less of an Obama fan, and here is why….the man has outsourced his leadership to the left wing of the Democratic party, and they have been drunk with the power of their huge majorities in Congress….majorities which have done them little good, because many, if not most Dems are way more moderate than their current leadership (and that includes Obama, even though he has tried to duck responsibility for the current logjam on healthcare). You may think Bush is a moron – I would not go that far – but he was able to work very effectively with most of the Democrats in Congress, until the war became his political millstone. The blame game may feel satisfying, but ultimately it is useless and even destructive. And yes, I give Obama credit for accepting the GOP invitation to meet……I think it is telling that he never did this before the Massachusetts election, but it’s a good start. If he continues to be open to this sort of give-and-take, I’ll certainly change my take on him. Drunk with power??? The Democrats wouldn’t know what to do with power if it bit them in the crotch. (as it seems to have done…) He hasn’t ducked responsibility on Healthcare, he admitted in the SOTU that he should have done more. (and will probably apologize latter for continuing to do nothing) I doubt that the left wing of the Democratic party is in charge, it seems more likely that nobody’s in charge. When people are in charge, stuff happens. Like when the right wing of the Republican party was in charge for eight years of Bush, and we got stuck in two wars, a massive deficit, the “Patriot Act”, crumbling infrastructure, “no child left behind,” and an economic meltdown. Gotta agree with you on the “nobody’s in charge” thing, TK….and also that the GOP was no better when it had the congressional majorities. The crumbling infrastructure and economic meltdown though shouldn’t really be pinned on tBush. Public union demands and legislative earmarking have gutted any real ability for the states and feds to use money for meaningful infrastructure improvement. And the economic meltdown is essentially a longterm result of the Community Reinvestment Act, passed in the Carter administration. Granted the GOP had their chance to kill it, but their efforts were puny, as they were too busy spending tax money like drunken sailors (or should I say drunken Democarats?). Should we push the meltdown further back? Whatever…..the blame game is still a useless smokescreen and primarily played by those who aren’t really willing to fix anything. Although the idea that the Native Americans could have developed torpedoes in the 15th century in order to avoid all of this is intriguing. I blame them. Priscilla, did you know about the unsolved mysteries from Nazca and other places in South America, that make you think about some super advanced civilizations? From these civilizations, it seems, the Natives did not learn to be warmongers against people they did not understand. If Natives were thinking as nowadays US Republicans, the Earth would be long gone. You want to blame Natives for not being Republican-like? I mean, it is not that hard to think like a Republican: have guns, look for wars, ban abortion to have more soldiers, preemptive strike anywhere, be the most powerful nation in the world even if other countries would suffer from that, don’t be cooperative for the good of other nations, be unlimited rich and powerful, be religious in a weird ways – in a word : don’t be moderate for it looks like socialism. Sure, Democrats are not better, ain’t they?